Watched On: The Big Screen! I took the boys to see this over the holidays and am just now getting around to sitting down and banging out a review of it. But I'll make it short, sweet and to the point: this might be one of the best Spider-Man movies ever made. The story begins with Miles Morales (Shameik Moore) on his way to an affluent boarding/charter school which he won a lottery to attend. His father, a police officer by the name of Jefferson Davis (Brian Tyree Henry) and his mother, Rio Morales (Luna Lauren Velez) a nurse have high expectations for Miles and despite wanting to go back to the public school he used to attend and feeling like doesn't fit in at his boarding school, he can't quite escape the fact that he might actually belong there. 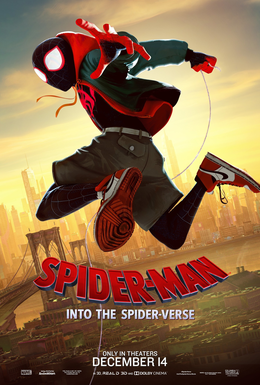 His Dad views Spider-Man as a menace, while Miles admires him- and sneaks out after school to visit his Uncle, Aaron Davis (Mahershala Ali) who estranged from Miles' father and takes him to an abandoned subway station where he can practice his graffiti- while there, he's bitten by a radioactive spider. He returns to the station the next day to search for the spider, but finds a particle accelerator built by Wilson Fisk (Liev Schreiber) who is trying to break through to other dimensions to find versions of his dead wife and son who died in a car crash. Miles watches as Spider-Man attempts to stop Fisk, but is gravely wounded by the Prowler and Green Goblin. Spider-Man (Chris Pine) seeing Miles and recognizing that he has spider powers as well, gives him a USB port to plug into the accelerator in order to destroy it and warns Miles that the entire city is at risk if Fisk turns it out again. Fisk then kills Spider-Man as Miles watches. Together, with the help of this universe's Aunt May (Lily Tomlin) they band together to take down Fisk and get back to their own dimensions-- but not before Miles finds out some secrets about his family and finally learns to master his abilities as Spider-Man for himself. Peter returns to his dimension, revitalized and ready to try and repair his broken marriage to his Mary Jane. Miles settles into his responsibilities as Spider-Man in his own Universe and, at the very end of the movie Gwen Stacey figures out a way to contact him across dimensions, setting up the inevitable (and personally anticipated) sequel. First of all: it looks beautiful. It combines contemporary CGI with hand drawn animation in a way that is visually stunning and really does feel like you've stepped right inside a comic book. Absolutely like nothing I've ever seen before in animation. Second of all: wow! The possibilities! The story! The Spider-People all over the place! It's such a massive breath of fresh air for the franchise because it links Miles Morales into the existing Spider-Man franchise by establishing the concept of a multi-verse, but it also allows Spider-Verse to branch out into I don't even know how many different directions! This honored the origin story of the original Spider-Man while establishing a brand new one (several brand new ones!) in a way that felt organic and entirely authentic. I think the fact that Miles Morales as a character has been around for a little bit and is already quite established in the comics helps this film avoid any of the usual fanboy charges that seem to stalk all these films as well. Finally and this is probably the biggest thing for me: the boys were absolutely entranced for pretty much the whole movie. Even the Medium Spawn paid attention to it-- it was the perfect introduction to Spider-Man for my boys and that made me very happy indeed.